A list of local client resources. The American Veterinary Medical Association (AVMA), established in 1863, is a not-for-profit association representing more than 82,500 veterinarians working in private and corporate practice, government, industry, academia, and uniformed services. Structured to work for its members, the AVMA acts as a collective voice for its membership and for the profession. Through a diverse mix of high-quality programs and services, AAHA assists veterinary practices in providing the very best in companion animal care. AAHA is the only organization that accredits animal hospitals throughout the U.S. & Canada. AAHA-accredited hospitals adhere to the highest-quality standards available, which helps ensure the best care for your pet. The Association for Pet Obesity Prevention (APOP) The Association for Pet Obesity Prevention (APOP) has launched campaigns to fight pet obesity within the veterinary medical community, veterinary schools, and state and local veterinary organizations, and has reached out to various media outlets. VOHC exists to recognize products that meet pre-set standards of plaque and calculus (tartar) retardation in dogs and cats. Products are awarded the VOHC Seal of Acceptance following review of data from trials conducted according to VOHC protocols. The VOHC does not test products itself. Eye Care for Animals is dedicated to providing the finest in veterinary ophthalmology services. Our staff of board certified ophthalmologists and clinical specialists provide the highest level of care, education, and understanding to our clients, their pets, and our referring veterinarians. The Cornell Feline Health Center is a veterinary medical specialty center devoted to improving the health and well-being of cats everywhere. A great resource for cat owners. The International Veterinary Acupuncture Society (IVAS) is a non-profit organization dedicated to promoting excellence in the practice of veterinary acupuncture as an integral part of the total veterinary health care delivery system. AAVA is asource for communication, continuing education, and support for Veterinary Acupuncturists in the United States. At TOPS Veterinary Rehab, our mission is to improve the quality of life of our patients by providing the best available rehabilitation and pain management servicesin a warm, comfortable, caring atmosphere. Our goal is not only to improve the physical condition of the patient, but to strengthen the pet-owner bond as well. Patricia McConnell, PhD, a Certified Applied Animal Behaviorist, (CAAB) has made a lifelong commitment to improving the relationship between people and animals. She is known worldwide as an expert on canine and feline behavior and dog training, and for her engaging and knowledgeable dog training books, DVDs and seminars. We are your best resource for any animal poison-related emergency, 24 hours a day, 365 days a year. If you think that your pet may have ingested a potentially poisonous substance, call (888) 426-4435. A $65 consultation fee may be applied to your credit card. 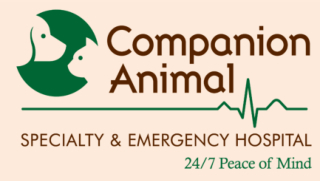 At Companion Animal Specialty & Emergency, we have a dedicated, fully-equipped surgical suite, should your pet's condition require immediate surgical intervention. Our in-house laboratory and radiology capabilities can provide crucial diagnostic information in a timely manner. Coping with the impending loss of a pet is one of the most difficult experiences a pet parent will face. Whether your furry friend is approaching his golden years or has been diagnosed with a terminal illness, it’s important to calmly guide the end-of-life experience and minimize any discomfort or distress. The Veterinary Wisdom Support Center is a website that has gathered the end-of-life wisdom you need to comfort, guide, and support you through this most difficult time.